In a medium skillet, lightly brown sausage and drain. 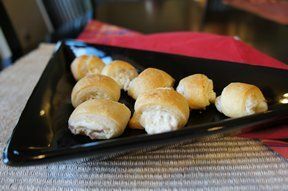 While sausage is still hot, add cream cheese and stir until cheese is melted and mixture is creamy. COOL COMPLETELY. 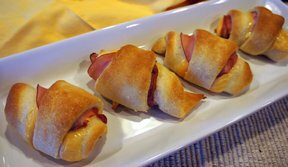 Separate crescent rolls into 2 rectangles. Form log of sausage mixture lengthwise down the center of each rectangle. 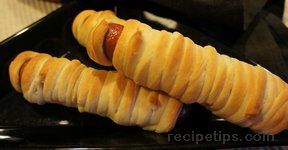 Fold over the long side of pastry to cover the sausage log. Place on ungreased baking sheet, seam down. Brush with egg whites. Sprinkle with poppy seeds. When completely cooled, slice into 1 1/2 inch slices.